Someone’s going on a diet! I replaced the stock steel fork with a Stella Azzurra cross fork. Weight savings of a little over a half pound. Sweet deal from Serotta on this one – under a hundred bucks. Replaced the stock handlebar with an old Ritchey Pro I happened to have sitting in my closet. Same diameter, same width. Lucky find. Shaved off a quarter of a pound. Man, that was one tank of a handlebar. Still fishing for cheap ways to shave off the pounds. Wheels would be the “big one” right now but unless the right deal drops out of the sky it’s cost prohibitive. I figure at this point, Stompy probably tips the scales at 21 and change. Good enough for now. Better than 22.5 anyway. Of course, I’ve actually gained 3 pounds since Mt. Washington, so this effort is almost entirely irrelevant and is basically nothing more than something to do. 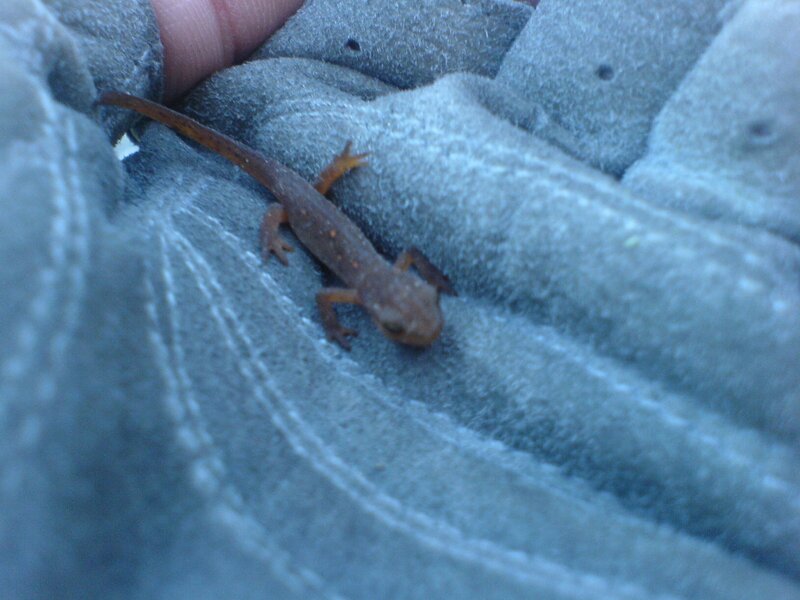 No pics yet, so here’s a newt I found at Kingman Farm a few weeks ago.